Administrative and biographical history: The Williams family of Edwinsford, also known as Rhydodin, claimed descent from Hywel Dda and Rhodri Mawr, and through Ellen, wife of Llewelyn ap Phylip, from Henry I of England. In common with many other Welsh landed gentry, the family married into other leading Welsh houses, such as the Morgans of Tredegar and the Vaughans of Golden Grove. Through such a marriage in 1600 the family acquired the Llether Cadfan estate in Carmarthenshire. Sir James died in 1811 and was succeeded by his only surviving son, James, who took on the arms and surname of Williams after the death of his mother in 1797. On his death in 1829 the estate passed to his eldest son, Sir James Hamlyn Williams (1790-1861). He left no male heir and with his death the baronetcy became extinct. By Sir James's will, his daughter, Mary Eleanor, inherited the Edwinsford estate, Clovelly passing to her sister, Christine. Mary married Sir James Drummond (1814-1866), 3rd Bart., of Hawthornden, Midlothian. He took on the additional surname of Willimas in pursuant of his father-in-law's will. On his death in 1866, the estate passed to his eldest son, Sir James H.W.Williams-Drummond (1857-1913) and then upon his only child, Sir James Hamlyn Williams Williams-Drummond (b. 1891). 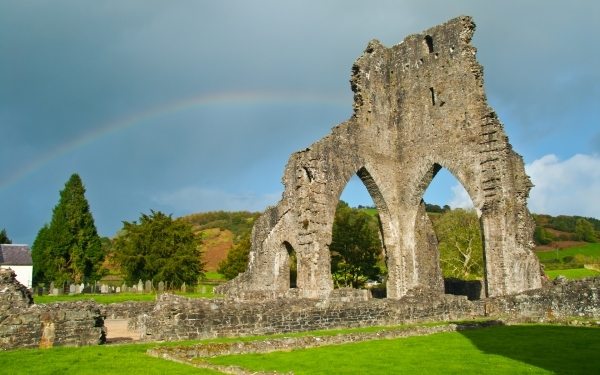 Talley Abbey (Welsh: Abaty Talyllychau) is a former monastery of the Premonstratensians ("White Canons") in the village of Talley in Carmarthenshire, Wales, six miles (10 km) north of the market town of Llandeilo. It lies in the River Cothi valley. Access to the site of the abbey is free. The Order was founded in 1120. In 1126, when it received papal approbation by Pope Honorius II, there were nine houses; others were established in quick succession throughout western Europe, so that at the middle of the fourteenth century there were some 1,300 monasteries for men and 400 for women. They came to England about 1143, first at Newhouse in Lincoln, and before the dissolution under Henry VIII there were 35 houses. Soon after their arrival in England, they founded Dryburgh Abbey in the Borders area of Scotland, which was followed by other communities at Whithorn Priory, Dercongal Abbey and Tongland Abbey all in the Borders area, as well as Fearn Abbey in northern Britain. some of our readers. Part of it is reproduced below. small fair is held there annually on August 6th. Cardigan, who purchased the tithes from the ancient family at Abermarles. burial-ground, consisting of half the tower and other considerable portions. Lady Mary Williams, and there are some Sunday schools. it had eight canons, and its annual revenue was estimated at £153 1s 4d. 1773, is now in Exeter cathedral. hills, was peculiarly adapted for devotional retirement and contemplation. Edwinsford, the property of Sir James Hamlyn Williams.